Check out this delicious easy recipe for fresh cranberries. 1. Combine the 2 1/2 cups sugar, water, vanilla and other flavoring choices into a heavy bottom saucepan. 2. Heat over medium heat until the sugar is dissolved, do not let the mixture boil! 3. Once the sugar is fully dissolved turn off the heat and remove the pan from the heat. 4. Wash the cranberries and pour them into a large bowl. Pour the syrup over the cranberries and place a heavy plate on the cranberries to keep them submerged. 5. 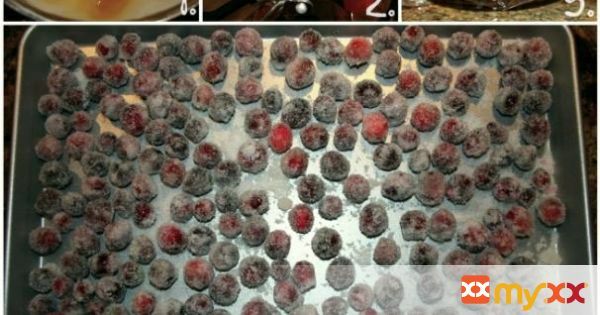 Refrigerate for 2-12 hours, depending on how sweet your want your cranberries. 6. Once you have reached desired sweetness, drain the cranberries (reserving the syrup for another use) and roll the cranberries in the reserved 1 cup sugar until fully covered. 7. Store covered in the refrigerator until all gone!